There’s not much new here, most of this has been said before. The purpose of this post is to sort of consolidate the “wind noise fix” details so that LS460/600 owners who are seeking a solution to their wind noise problems will be able to find the details of the “triangle trim fix” – AKA the “jmcraney wind noise fix” - without having to read all the discussion thread. If you have some interest in the LS460/600 wind noise problem beyond just fixing your car, the first Wind Noise discussion thread (covers the period Jun 07 thru Apr08) on Club Lexus Forums, “LS460 Wind Noise Fix (merged threads)” (https://www.clublexus.com/forums/ls4...d-threads.html) is good reading. It is a horror story of epic proportions pitting those owners who thought that they didn’t have wind noise against those who were certain that they did have wind noise. And in all this, Lexus was franticly doing lots of things, such as replacing the side windows, adding foam to doors, sending experts from Japan, etc and making lots of promises to get the problem under control but having little unequivocal success with anything. When this discussion thread ended Lexus was beginning to take the tack that the wind noise that many were experiencing was imaginary and that the cars met “specification” and there would not be any help coming from Lexus. The moderators ended the first wind noise discussion thread when the “triangle trim” defect was identified as a major source of wind noise and started a new discussion titled “LS460 Wind Noise Fix (continued discussion)” covering the period 19Apr08 – the-present. There is lots of wisdom there. The discussion is long, currently at 721 entries, but if you have some real interest in this subject you should read all of it (https://www.clublexus.com/forums/ls4...iscussion.html). Although a few other causes of wind noise have been identified in the discussion, the triangle-trim-defect seems to be the major problem in the majority of reports from owners in the discussion. 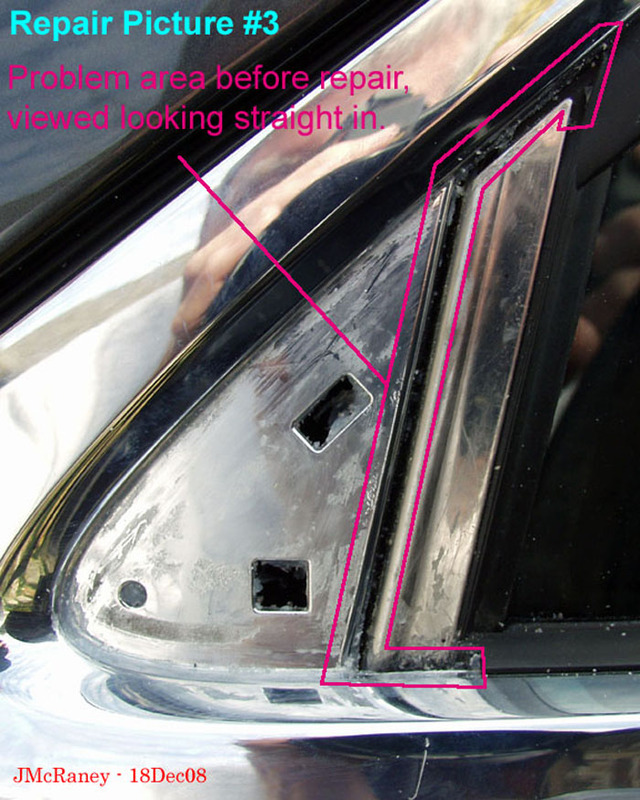 The triangle trim repair applies to all 2007-2010 LS460/460Ls and all 2008-2010 LS600s. Some of the cars have the trim defect when they are new, others develop it as they age. The triangle-trim is located at the forward corners of the windows in the front doors. 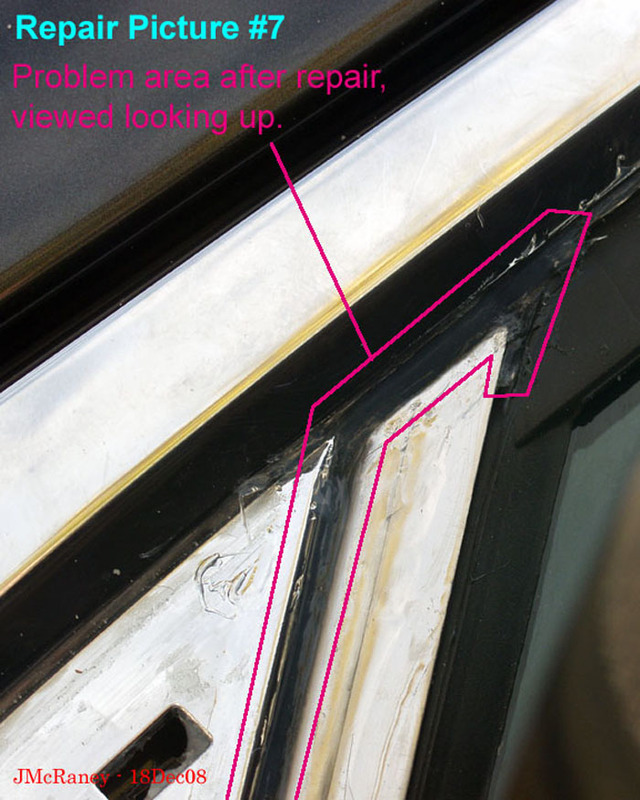 The triangle-trim-defect is caused by a failure of the adhesive on the trim to adequately adhere to the vehicle door structure and that causes both a whistling noise problem and poor isolation from sounds that are occurring outside the car. There are several reasons why this happens. 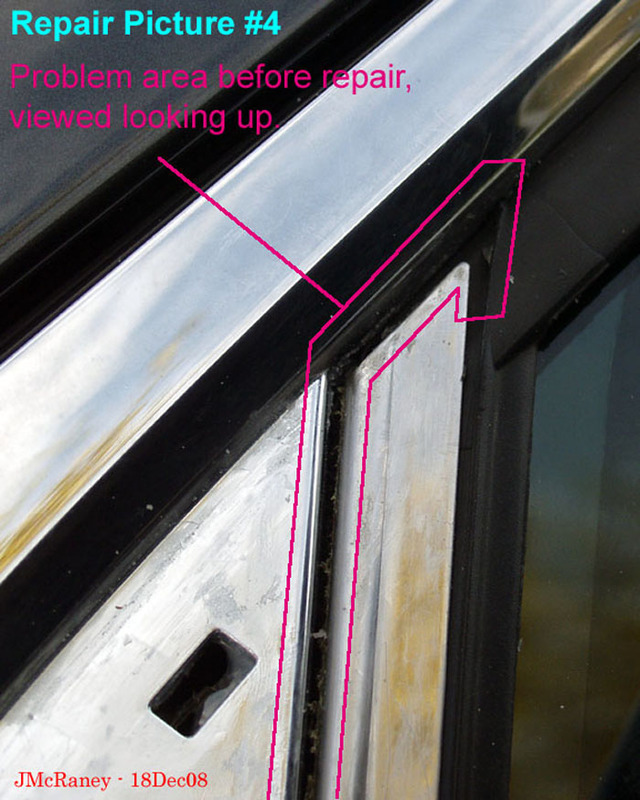 The most common reason is caused by the adhesive on the trim being prevented from making contact with the door structure because the aft edge of the trim makes contact with the window gasket before the adhesive can contact the surface that it is supposed to mate with. 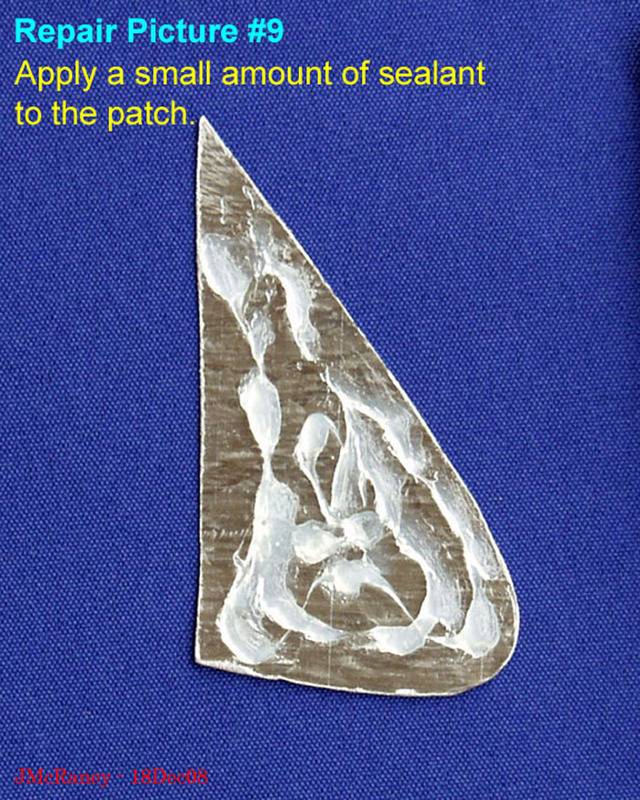 The effects of this defect can vary from slight to severe and can be left, right or bilateral depending on the extent of detachment. If you have a desire for a deeper understanding of this issue here is a short analysis of what I found with my car. The following may be beyond your scope of interest but in case you might have some curiosity about all this I thought I would tell you about some things to look for. 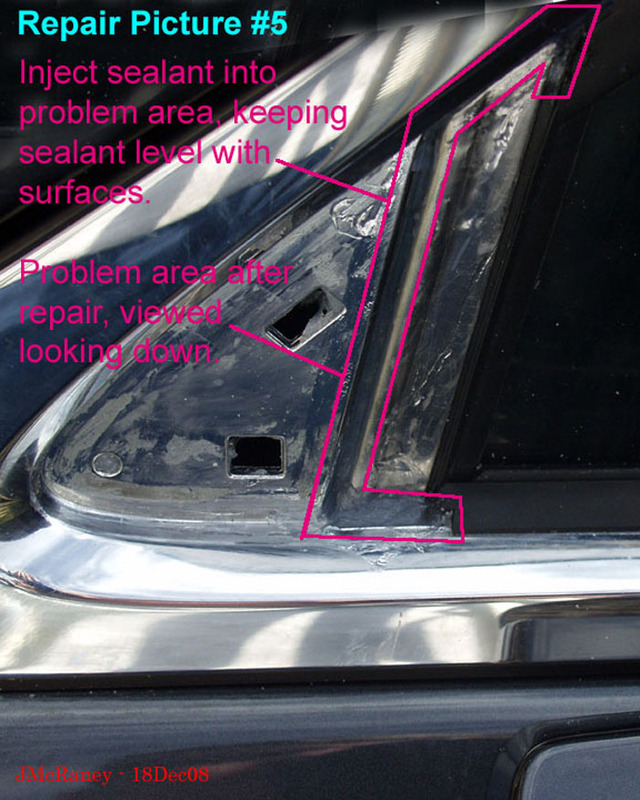 After you get your trim off, and before you start the cleanup/prep, you will have an opportunity to gain some knowledge as to why your car was having a noise problem at the window corners by looking at how the adhesive/gasket residue is distributed on your car and the trim that you removed. The trim detachment – the cause of the wind noise problem – is a little different for every car. I am going to use a picture of mine as a talking point to help you understand what to look for. You can see in this picture where the trim was detached by noting where there is adhesive/gasket residue. If the gasket had adhered properly there would have been very little wind noise. Ideally, if the gasket had stuck well, there would have been residue from the gasket left on the car and the trim uniformly. By looking at the picture of mine, you can see that the trim was not attached along the bottom leg of the triangle and most of the rear leg of the triangle because the gasket in that area stayed with the trim when it was pulled off. The upper corner of the trim was well attached as you can see that the gasket/adhesive stayed on both the car and the trim. 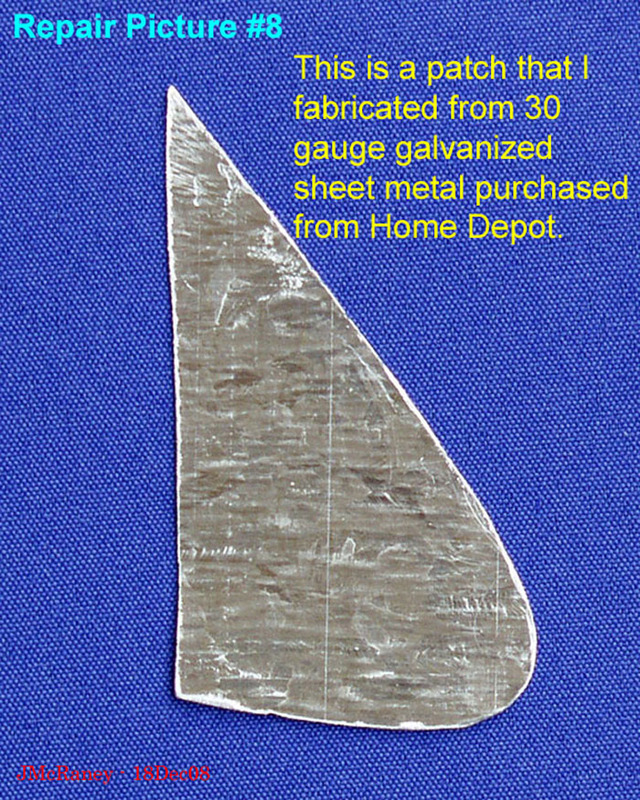 The gasket/adhesive had separated from the trim on the forward point and part of the upper leg of the triangle as evidenced by the gasket that remained on the car. Several things happen as a result of the trim being loose. There is air intrusion through the registration holes. That large gap at the lower rear corner of the trim becomes exposed. The trim may vibrate and/or produce a diaphragm effect – sort of flutter like a clarinet reed or act like a drumhead. 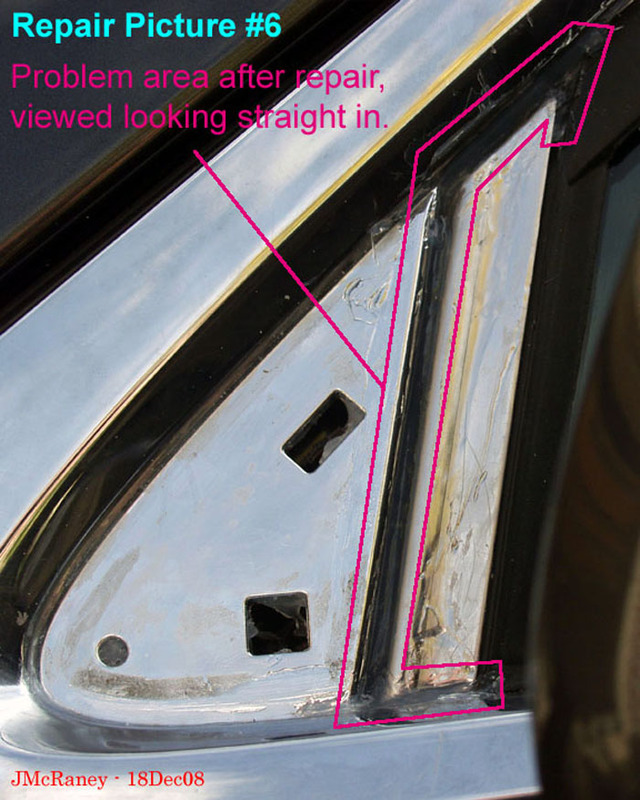 There are lots of ways to tell if the trim is loose, but all cars will likely benefit from the repair so it is sort of a waste of time to give that too much thought. How do you get the trim off? 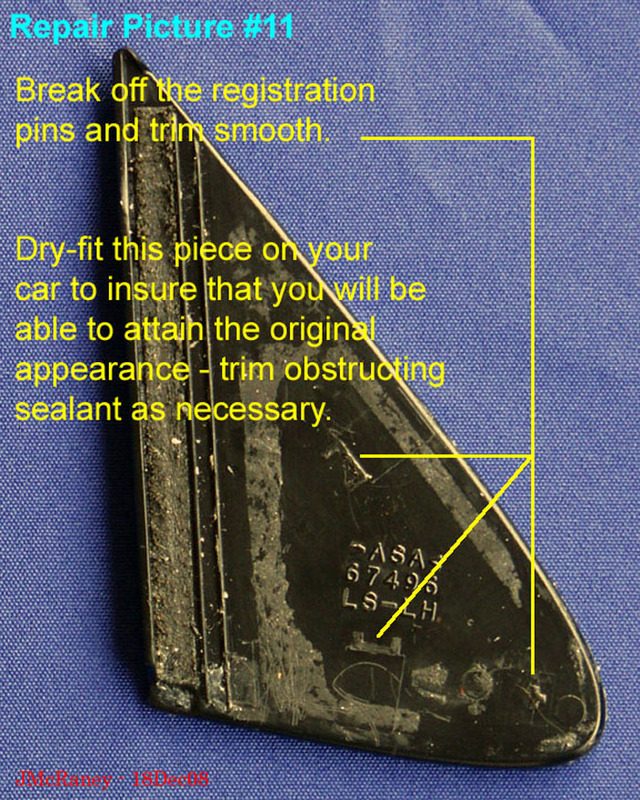 For cars that are “factory fresh” – those that have not had any repair attempts to the triangle trim – getting the trim off is easy. In the process of getting the trim off, you need to be philosophical, if it breaks, it breaks. I have helped many people do this and I don’t know of a single person who has broken their trim. The trim is made of very durable material and seems very unlikely to break. If you break your trim, replacement parts are readily available over the Internet and through Lexus and Toyota dealers, maybe overnight delivery, for about $15 each side. I can help you with the Internet solution if you need it. You can see that it has three registration pins, two of which have clips on them. When you take the trim off, the clips and registration pins will likely break off and fall into the door. A couple of people have expressed concerns about this being loose in the door. No one has ever reported a problem with this. Those pieces have very little mass and should never be a problem. If it becomes a problem it can be dealt with. The best way to get the trim off is with your fingers. Just lift at the upper rear corner, you might have to use a sharpened wooden paint stir stick to get it started, and sort of peel it off slowly like you would a piece of tape. If you don’t have enough finger strength to get it off, then use a sharpened wooden stir stick to stick under the aft side and sever the white tape. When you start to work on this you are going to think, Oh My, it’s going to break any second, but I don’t think you could break it with a hammer. A caulk spreader and a sharpened paint-stir-stick are handy for doing the repair. 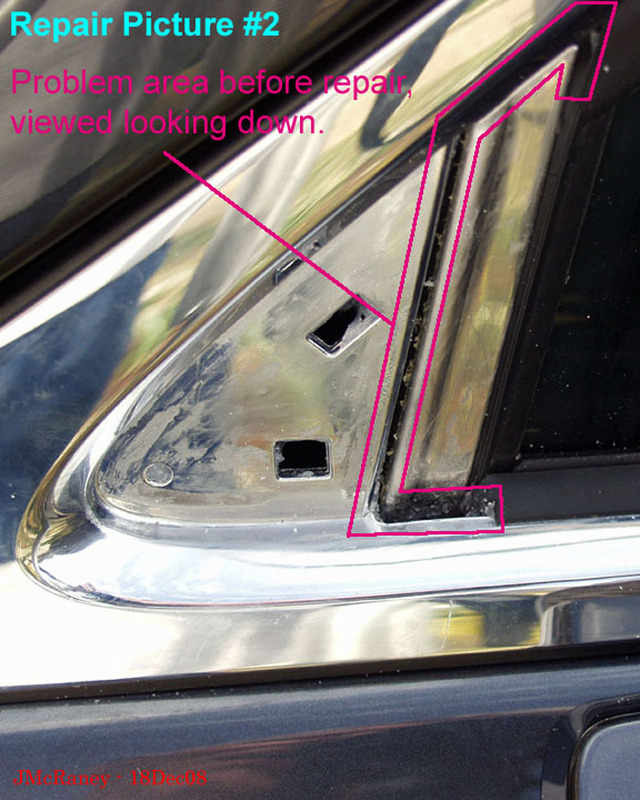 Here is a very conservative way to repair your car that has yielded good results for many DIYers. It may not be the fastest way or the easiest way but no other way will give better results and since this takes only about 10 minutes per side to accomplish, finding a faster way seems like wasted effort unless you are in the repair business. I have hesitated to refine this method because I expected Lexus to take over my business but so far something has delayed their response. 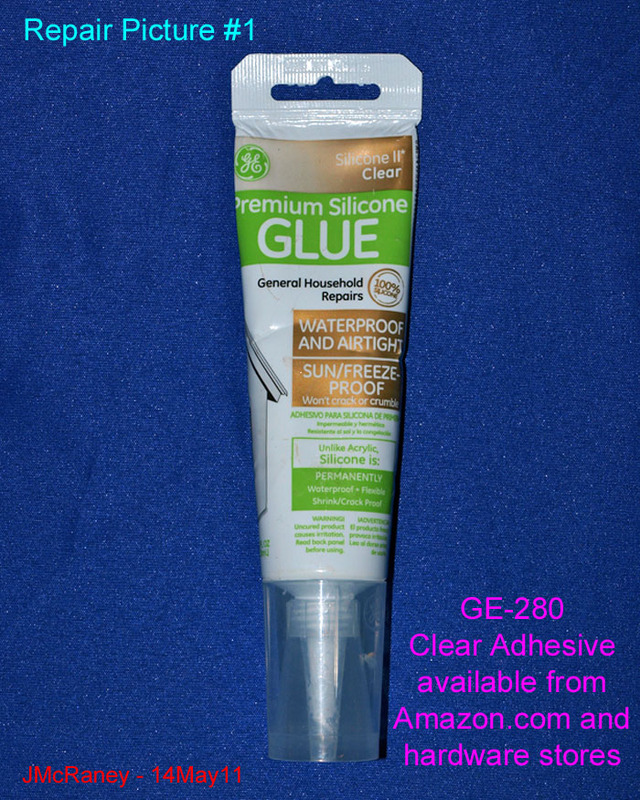 I suggest that you use the exact sealant that I have recommended, if you can find it - the General Electric stock number is GE280. 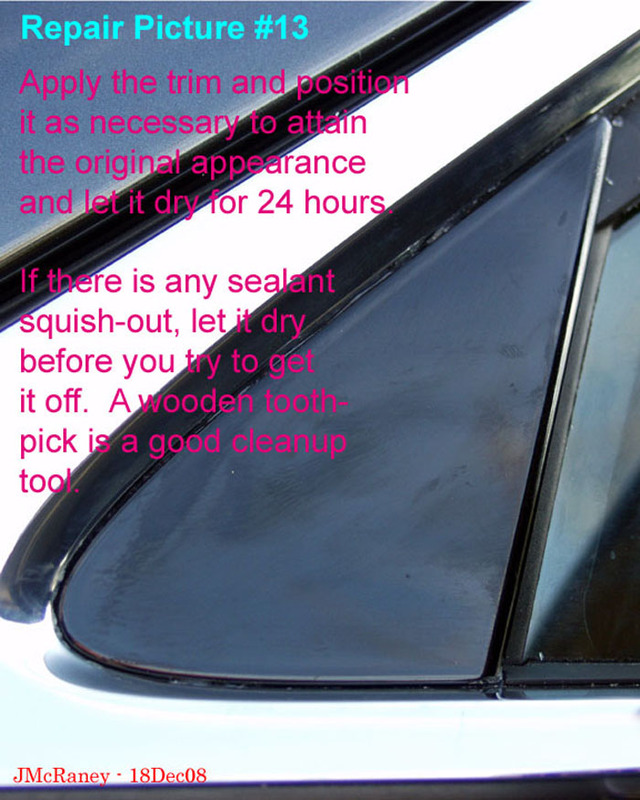 A tube of sealant is enough to do about 10 cars so use it judiciously. I continue to believe that this is a very satisfactory product for this task. 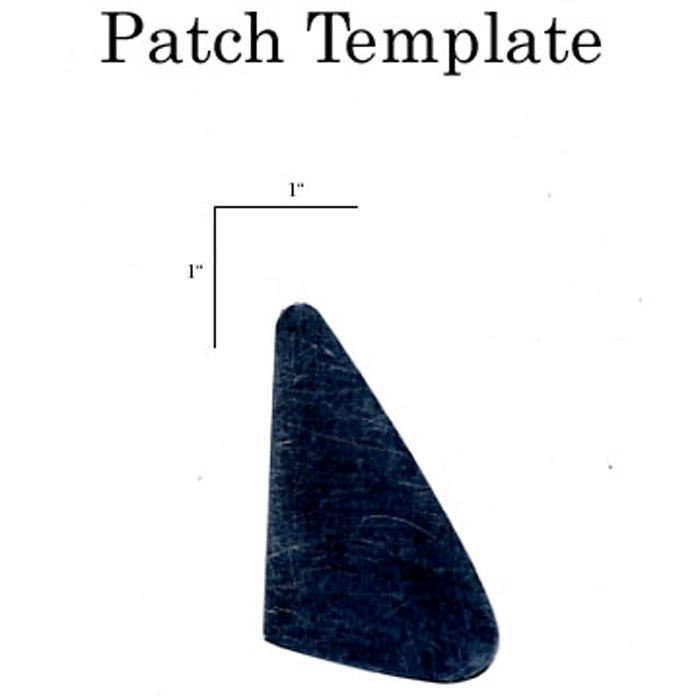 This is a template that you can use to cut your patches. You can use cheap scissors, the kind with the orange handle, that you buy at an office supply store to cut your patches from the 30 gauge stock or whatever material you choose. You might want to finish the edges with a file. It is kind of hard on the scissors but you can do a lot of patches before the scissors give up. When you get the metal patch in place you need to let everything dry overnight and then your car is weather tight. If you break the trim you can drive your car and take as long as you need to while you get a replacement trim piece. I recommend that you wait for about a week after you put the metal patches on before you put the black plastic trim on. That will give you a chance to evaluate your handiwork under dynamic conditions before you apply the trim. Be sure before you put the trim on to check the patch for good adhesion. You can do that by picking at it with your fingertip. If you have chosen a different type of sealant/adhesive, I suggest that you avoid using a fast-drying or contact type product at this point. You want to avoid having this piece under stress as it cures. Some fast drying products have lots of shrinkage and of course contact cement will almost certainly induce stress. If this part is under stress the seal may rupture when the window is operated. It might be important to do this step with the window up as there is a slight bow-out of the window gasket when the window tops out. If it doesn’t go well, and you have used the sealant that I recommended, you can take it off and do it again many times. Clean up is easy. Last edited by jmcraney; 05-14-11 at 08:28 AM. My car is a 2007 LS460. Delivery from the dealership was 28Sep07. Within two weeks of delivery, I had driven my car enough to understand that it had a serious wind noise problem. When I got the new car survey that always comes with a new Lexus I noted very clearly on the form that I had a major problem with wind noise. I printed, in bold letters, the comment that I was embarrassed for my friends to ride in my new car because the wind noise was so severe. My expectation was that someone from Lexus or the dealership would contact me and say please bring your car in so we can resolve this problem, but I never heard anything from them. For the first six months that I owned my car, I was aware that it had a major wind noise problem. At that time I was always sure that it could be fixed if I could get the right person interested in the problem. During the first six months I took my car back several times and the dealership always seemed interested, changed the windows and other things but finally they said that all that could be done had been done and if I wanted anything else done I would have to speak to Lexus. At the dealership there was a sort of strange attitude about all this, sort of like I must be imagining that my car had a problem or that it was a problem that could not be fixed. I remained confident that the problem could be fixed if I could just tell them exactly what was wrong. I called Lexus Customer Service and arranged an appointment for one of their specialist to look at my car and I decided I would write a description that would give them enough information to point them to the problem. Here is what I told Lexus about the problem that I was having with my car. Regarding my 2007 Lexus LS460 VIN JTHBL46F075051819. Thank you for taking the time to look into my “wind noise” problem again. Before I contacted Sewell Lexus I had not looked at the Internet at the Lexus Users Forum where, you are probably aware, there is much discussion on this subject. I feel bad for you. What a mess. This sort of thing feeds on itself sometimes and often the criticism is over blown. I have tried to be objective and fair about my concerns. First of all, I love my LS460, except for the wind noise. I traded in a 1997 LS400 that had 67,000 miles. As you can see I keep cars a long time, so how you resolve this problem will probably not have a big impact on your future sales. It was apparent early on that there was some sort of air leak around the front windows but I kept trying to convince myself that it was my imagination. There also seemed to be a noise leak too. I often had the sensation that the window was not fully up or that the door was not closed fully. I would have cars pass me while I was stopped and I had the sensation that a window was partially down. And I noticed that as I increased speed that the noise level inside the car quickly overcame the audio system even though I had the ASL enabled – I am confident that I understand how to enable the ASL properly and that it is working as it is designed to. I don’t drive fast so I am not talking about speeds over 65 MPH. It seemed to be much noisier than my old car. I took my car back to the dealership in January to tell them about my concerns and they said that there was a service bulletin to deal with the wind noise problem. It involved replacement of the glass in the front doors. Having that sort of thing done to a new car was a little disconcerting. But they did an impeccable job and I don’t have any concerns about that anymore. After that there seemed to be some improvement in the noise problem. In trying to assess it I have used my 2004 Toyota Sienna as a reference. I noticed that when I am stopped in traffic that the Sienna has better isolation from the noise of cars that are passing. I would expect my new LS460 to be much quieter than it is. Also when I am driving my LS460 I notice noise from vehicles if they overtake me. This is much more evident when compared to my 1997 LS400. You might argue that this effect is due to the LS460 being quieter overall. But that is not my perception. The noise seems to come from somewhere on the front doors. As for the wind noise: that has been a major problem, mainly because I have had great difficulty in understanding it and being sure if it is a problem or not. Sometimes it is barely noticeable and other times it is terrible irritating and even fatiguing. Over the past couple of months I have tried to be hypersensitive to all aspects of this problem so that I can give you a chance to help me with it. I tried driving the car down a perfectly smooth road on a day when the wind was calm and at 40 MPH it was as quiet as it could possibly be. I noticed that as I increased speed to 50 MPH there was slight increase in the noise over my left shoulder and that at 60 MPH this was very noticeable. You might again argue that this effect is due to the car being quiet overall. It would be difficult to resolve this without instrumentation to quantify the noise. It finally came to me that the real problem happens on windy days. I noticed that when I drove the car at 60 MPH and the wind was coming directly behind the car it was as quiet as it was at 40 MPH. But, when the car was driven into a headwind the noise level increased dramatically. Aerodynamically, it is kind of like driving 90 MPH, if you are driving 65 MPH and the head wind is 25 MPH. This effect becomes much worse if the wind is not coming from exactly 000 degrees relative to the motion of the car. For example, if the wind is coming from 045 degrees or 315 degrees relative to the motion of the car and the wind has a gust component too, it produces a kind of noise that is very irritating. Along with the roar there is a noticeable air leak around the front door windows – seems to be mainly in the front corners – that is sort of whoosh sound. This only happens under certain wind conditions. In fairness I have to admit that most cars don’t perform well in these sorts of conditions. But, my LS400 seemed to be much better than my new car. I want to tell you about another observation that is sort of interesting. Recently, on a windy day (wind speed around 20 kts), I was driving on a circular ramp (cloverleaf), going about 25 MPH, to enter the freeway. As I drove around this ramp I changed the car heading 270 degrees. At some point in that rotation I noticed a sensation that the wind was blowing through my car. It was so noticeable that it caused me to consider the potential for rain to might leak in under certain conditions. 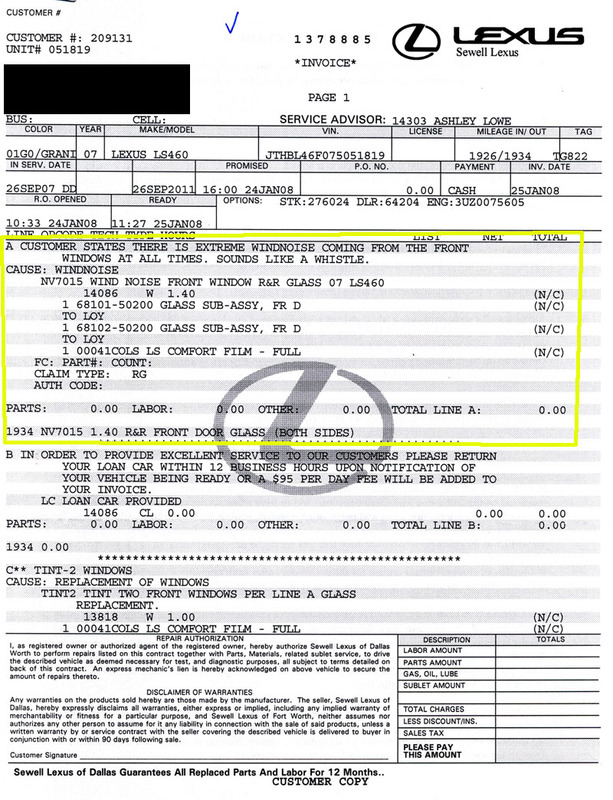 I spoke to the Lexus service representative about this and he assured me that he is unaware of any rain leak reports for the LS460. Recently I was driving approximately 35 MPH on a windy day, wind 15 MPH and gust to 25 MPH, and the wind direction relative to the motion of the car was about 120 degrees and the wind noise around the front door windows was very annoying. The wind noise problems only occur under certain driving conditions that are not easy to demonstrate to you and it is not easy for me to immediately evaluate any fixes that you might implement. But I assure you there is something wrong. A luxury automobile should not have this problem and I am very disappointed that I have acquired this problem at such a high price. It never occurred to me that I might have a problem like this with a Lexus. They, the dealership, called me to pickup my car on April the 11th. When I picked up my car a representative of the dealership told me that the Lexus specialist said that the noises that I was hearing were normal and that my car met all specifications and that there was nothing else that they could do for me. I got a phone call from Lexus Customer Relations a few days later saying about the same thing. Here is a copy of the coup de grace service order that delivered the news that there wasn’t anything wrong with my car. After some careful thought I decided that I would not be able to keep the car with that sort of problem because it was about to drive me crazy so I proceeded to negotiate for a trade for a 2008 LS460 with the expectation that I would get a favorable deal because of the circumstances. 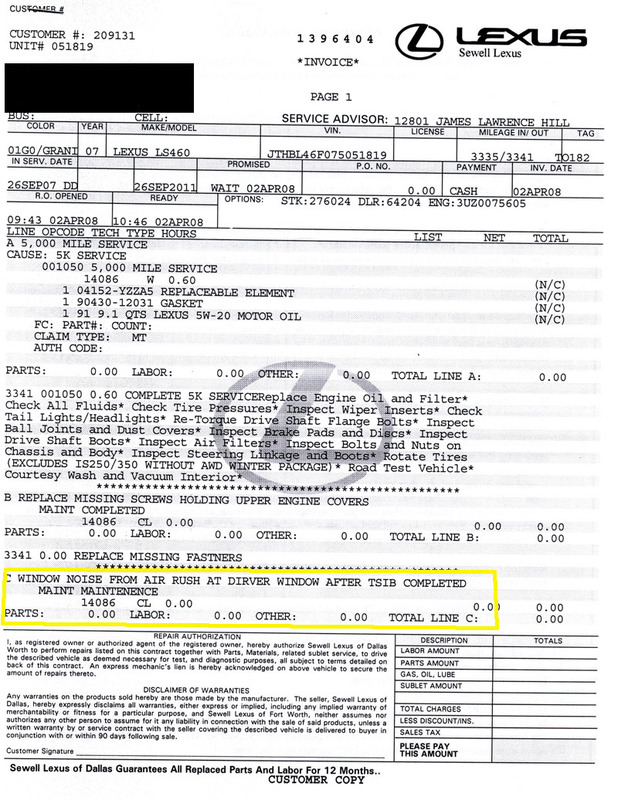 A verbal offer of $7600-and-my-car for a 2008 LS460 was made by the dealership salesman. I declined and the following email exchanges followed. Thank you for your time yesterday. After careful thought, I have decided that $7600 is too much money to solve a problem that I should not have. Lexus should be ashamed for their lack of attention to this problem. Although they have spent a lot of money replacing the front windows there is still a problem and it seems to me that they have just thrown up their hands and given up. I have spent a lot of time looking at opinions of other Lexus owners about this problem that are posted on several sites on the Internet. For now I am going to give this some more thought from an engineering perspective. If I have a “breakthrough” I will share it with (dealership customer relations manager). On the way home yesterday, after driving your 2008 LS460, I made some more mental comparisons and I do believe that the 2008 is significantly improved in some aspects of the noise problem. I am sorry we couldn't make it better. Would another $1000. help? Please let me know. I would not even consider it for anything over $3500 and I am sure that is way beyond what you can do. For now I am going to look more seriously at understanding what the exact problem is. I spoke to (dealership customer relations manager) and he said he would be able to extend a 7 year 100,000 mile warranty to you. It has a value of $2,500. We are trying. Thank you for the offer. I know you and Sewell are trying. For now I would not consider anything above $3500 total out of pocket. I am working on a solution or partial solution to the noise problem that seems very promising. It takes about ten minutes to implement and cost about $1 in materials and is completely invisible. I have already done my car and there seems to be a nice improvement in the noise isolation. I just need a windy day to really get a good evaluation. I would be happy to share the details with (dealership customer relations manager) if he will send me his email. I think my solution would be of value to Sewell Lexus service department and Lexus Corp. I have driven my car and it is much quieter, both from the wind noise and the noise from passing traffic. It is never going to be completely isolated from crosswind noise, nor would I expect it to be, but it is much improved. I think my car is now quieter than the 2008 that I drove on Wednesday. I realize that this noise problem has been a complex issue and that what I recently did my not have been the only problem. The car now fully meets my expectations. Thank you for your efforts and patience and wisdom in dealing with this. When I took the pictures and wrote the description of my efforts yesterday I did that with the intention of posting it on the Lexus Owners Forum on the Internet. It occurred to me that you or one of your employees might have a way to capitalize on this information through an employee suggestion program and if that is the case I would be happy for you to do that. And it is also possible that my information is only applicable to my situation and of no value to anyone but me. Let me know if you want to use my information, otherwise I will post it on the Owners Forum and let the readers decide for themselves. Jeff: Thanks for your input. I will share with Lexus. Great! I am sending you the high resolution version of he photos in case they of any use to you. I have driven my car several times since I sealed under the trim at the corner of the front windows and I can tell you the improvement is stunning. My car is now quieter than the 08 that I drove last week. I hope you conveyed my information to Lexus. I did post my information and photos on the Lexus Owners Forum and there seems to be some interest there. I hope that my solution has wide applicability and will give Lexus some relief from this bad situation. The response that I got from the dealership was that they would pass it on to the Lexus rep the next time he came around. When I asked when that would be I believe the response was that he would be around in a few weeks. I then decided I would get the information to Lexus directly because I wasn’t real confident that the dealership or Lexus rep would follow through and I began a telephone and email campaign with Lexus Customer Relations. I also spoke to the dealership general manager about my wind noise problem and I wrote a letter to him soliciting his help to inform Lexus about how I had fixed my car. I spoke to you on the phone a couple of weeks ago regarding a wind noise problem with my 2007 Lexus LS460 (VIN JTHBL46F075051819). Your (salesman) and (customer relations manager) promptly followed up with a suggestion that I consider a 2008 LS460 and I came out to your dealership and drove one. I decided not to go that route for several different reasons. Subsequently I discovered a fix for my car and I am very happy with it now. I wanted to share my discovery with Lexus because it might be of value in solving this kind of problem for other customers and I tried to get my information to them several different ways but the harder I tried the harder they pushed back. I am not sure why all the resistance. I explained that my phone calls were not hostile but could not get them to acknowledge me. The details of how I fixed my car are enclosed. This information has also been sent to Lexus’ legal department via USPS mail (I had an email last week from them last week requesting my “proposal” in writing). This information really needs to go to their engineering department so I am not sure why it was directed to the legal group. I am not presently considering any type of legal action and I have not intentionally given that indication either directly or tacitly. While my information may have limited applicability I think it is important that someone who can appreciate it gets to review it. I hope you will use one of your contacts to insure that Lexus is aware of this – it might be very important to them. I want to acknowledge the help and wise council I have received from your (customer relations manager) on several different occasions – he has been my main point of contact at (dealership). Lexus was not returning my calls and when I had my car in for service recently I visited with him and told him that Lexus was not returning my calls. He tried to call them while I was in his office but it was too early to speak to CA. I did get a voice mail later that day and I spoke to them the next day and arranged an appointment to have my car “evaluated” by a Lexus representative at your dealership on April 10th. That evaluation brought the message that “sorry, nothing else can be done” conveyed through (customer relations manager) and a phone call from Lexus Customer Relations a few days later and another “sorry.” I did tell that person who called from Lexus that I had fixed my car and I expected that I would get a call from someone else wanting more details but they never followed up with me. I am enclosing copies of some of my communications on this topic. You will see that I aired some of my concerns on the Club Lexus forum. That was a desperation attempt to get some attention from Lexus. I tried to stick to what I knew about the problem while being careful not to disparage Lexus or (dealership). If you see anything that offends you please give me an opportunity to explain. I would also like to acknowledge your (service writer – he listens well and is very attentive. My compliments to you on your dealership, where I found everything just about perfect. 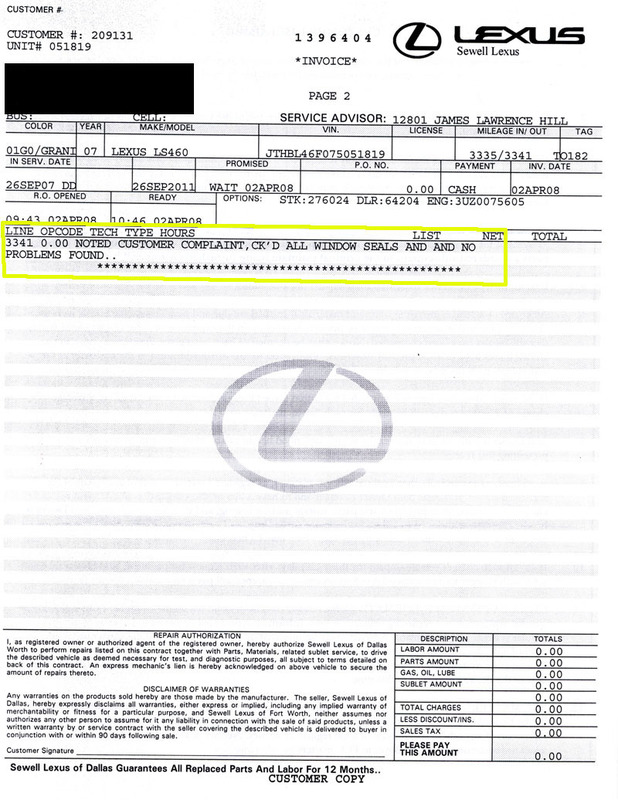 Any feedback from Lexus on whether they found my information about LS460 wind noise useful? Hi...I plan to share it with our local Technical representative during his next visit. I would suggest you send the info to Lexus directly. They truly appreciate the "Voice of the Customer". I have missed you several times on the phone, so we have never spoken but you have left me several messages. You are my last hope of getting this information to Lexus. I tried everything I know. Jay at Sewell Lexus gave me your email address. My contact with has been regarding a wid noise problem with my 2007 Lexus Ls460 VIN JTHBL46F075051819. After speaking to one of your assistants I took my car in on April 10 for an evaluation. The feedback I got from that, through Jay, was that nothing else could be done, Sorry. I decided that I could not stand the problem so I tried to work a deal to replace my car with a 2008 LS460. The 2008 was not a great deal quieted than my 2007 and their price was beyond what I thought was fair. I decided that I would try to solve the problem myself. I had been following some of the discussion on the Internet about this subject. One of the first things that I did was remove a piece of trim at the corner of the windows in the front doors where I found some areas that I thought were real problems. I sealed the problem areas and replaced the trim. It has made an astounding difference in my wind noise problem. I think this information is very valuable and important to Lexus. It might go a long way to solving the wind noise problems. Here is what I did and a couple of pictures. And also here is a link to the Club Lexus Forum where I have been trying to get some interest because I can’t get Lexus to respond. 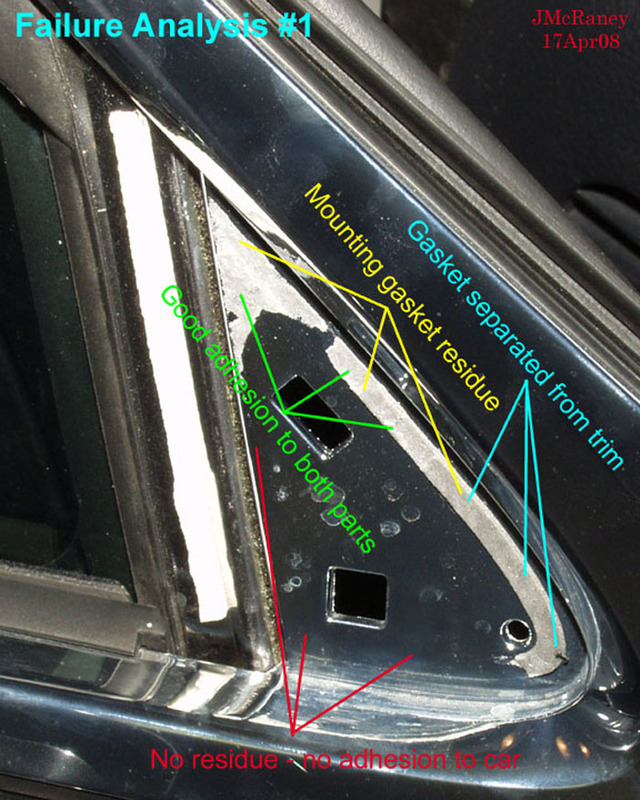 In trying to help the “wind noise problem” in my 2007 Lexus LS460 I discovered that there are some gaps under the plastic trim that is located in the forward corner of the front passenger & driver door windows. These gaps seem to allow air and noise to enter the passenger compartment under certain windy conditions. It looks like the engineers sort of painted themselves into a corner. My solution is fast, and cheap but requires that the vehicle not be driven for 24 hours. First, you need to take a flat instrument, like a small putty knife, and pry up a corner of the trim piece. After you get it going, just slowly peel it off. It is attached with some double-sided tape that will let go with a little pressure. There are some retaining fingers that will probably break off but that doesn’t make any difference. There are two gaps that are the real problems. 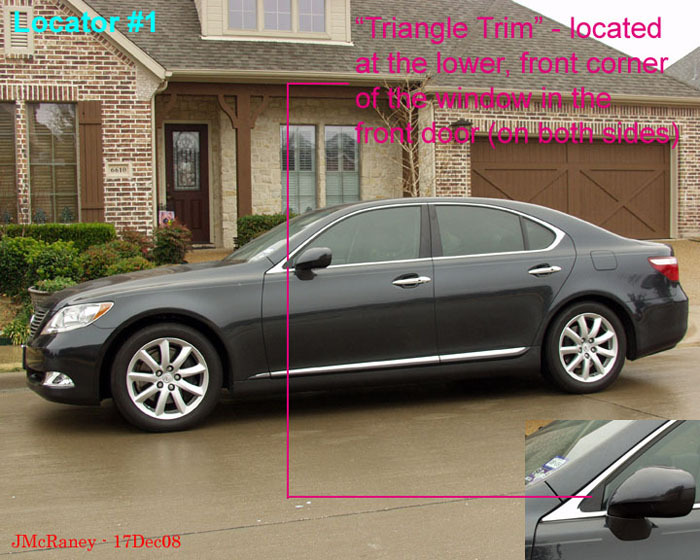 They are located at both of the corners that are toward the rear of the car. You need to fill in the gaps with some sealant material. I used clear Silicone II that is available at Home Depot. Apply the sealant in a pattern that is depicted in the attached photograph. Then press the plastic trim piece firmly back in place. If there is any “squish-out” let it cure for 24 hours and then you can trim it off or scrape it off with you fingernail. 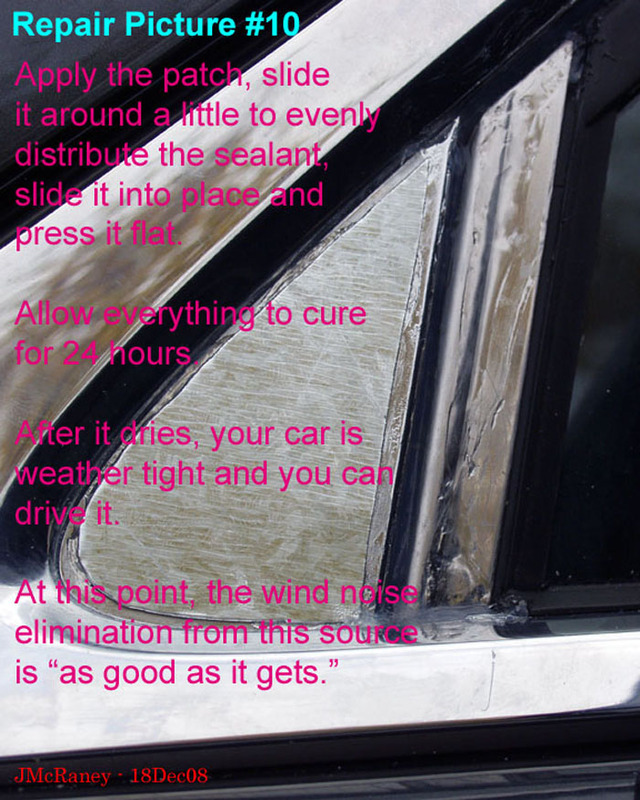 You need to let it cure for 24 hours before you drive the car because the air pressure that in generated when the car is being driven might push the fresh sealant out of the areas you are trying to seal. Then I got this email that was forwarded to me by the customer relations manager at the dealership. forwarded to the Legal Services Group for reply. give consideration or advice to an idea. Thank you again for thinking of Toyota. Then on 25Apr08 I received the following email. Recently you submitted a question to the Lexus Customer Satisfaction Department. Thank you for contacting Lexus Customer Satisfaction. We are dedicated to providing superior service. In circumstances that require our attention, we will assist in the resolution process. We appreciate the time you have taken to inform ups of your discovery. I recommend providing your proposal in writing and sending it to our legal department. I have provided the address below where you can send your proposal. I do apologize for any inconvenience this may cause you. If you require further assistance, please respond to this e-mail, or contact Lexus Customer Satisfaction at 1-800-255-3987, Monday through Friday, 5:00 am to 6:00 pm, or Saturday, 7:00 am to 4:00 pm, Pacific Time. I have enclosed my details regarding a possible fix for the wind noise problem that plagues some of your 2007 LS460 models. I hope my information will provide some relief for you and your customers. It has provided a solution for me and I am now very happy with my car. Thank you for allowing me the opportunity to present my information. 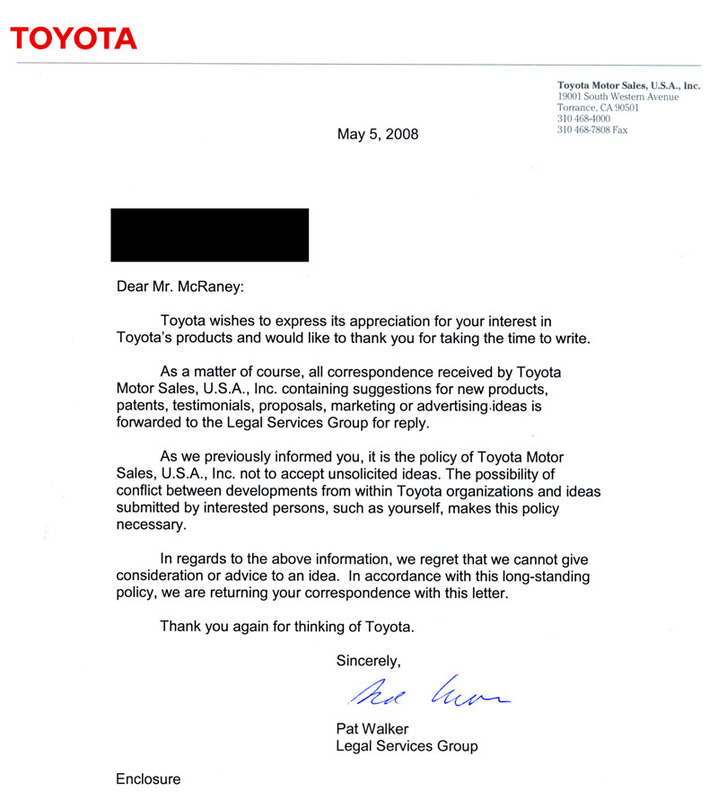 I never received any kind of acknowledgement from the dealership general manager that he received my letter. Several weeks later, while getting my car serviced, I visited with him for a few minutes and he was cordial but noncommittal about the wind noise. I continued trying to get the attention of someone at Lexus to tell them about the wind noise fix until I got a telephone call from one of their attorneys telling me in rather harsh language that they were not interested in anything I had to say. I was really taken aback by the call from the attorney because I had not ever had a harsh or unkind word with anyone either at Lexus or the dealership and I was wondering if they had gotten me mixed up with someone else. 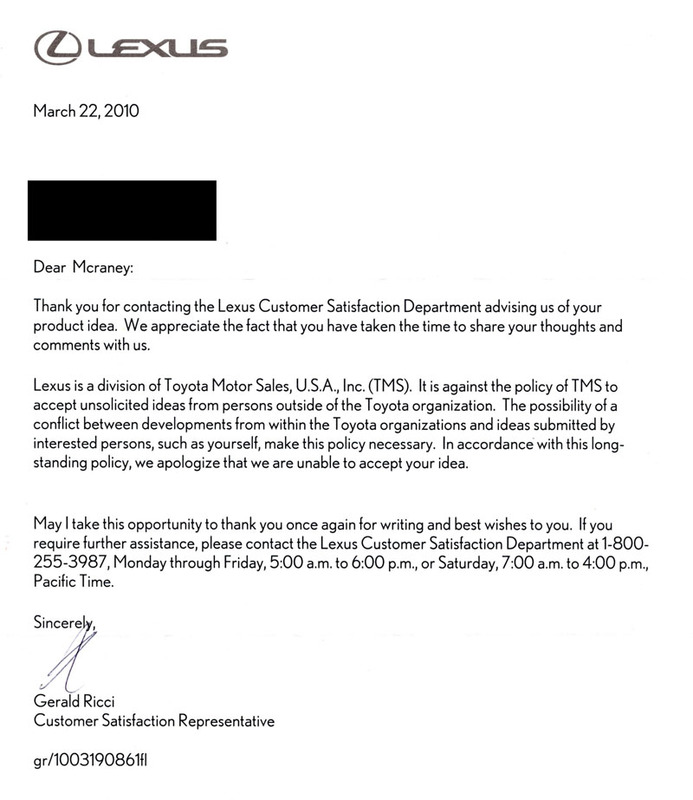 I ended up sending Lexus Customer Relations an email on 04May08 telling them that I would try to get the word about the wind noise fix out to LS460 owners some other way. I bought a new Lexus LS460 in Oct 07. When I got the customer survey that comes along with a new car purchase I entered it electronically and the main thing I said was that I was so embarrassed by the wind noise that I was reluctant to have my friends ride in my new car. I just knew that someone from Lexus customer relations would be contacting me to help get that problem fixed. Time rocked on and nothing from Lexus. I kept trying to figure out if I was imaging this problem or I had a real problem. One day in January I was in the Costco parking lot about to get in my car and an Indian man (the kind from India, not Oklahoma - we have both types here in Texas) approached me and asked if that was my car, pointing to my car. I assured him that it was mine and he inquired, with a heavy accent, about any problems I was having with it. I told him I had a wind noise problem. He made that international gesture for frustration, when you sort of flop your hands out as you roll your arms down and said something about his car driving him crazy. His car appeared to be a 2007 LS460. He told me that his dealer, the other DFW dealer, had told him that nothing could be done and if Lexus came up with something they would call him and that had been 6 months ago. I then decided that it was not my imagination and that I would go back to (my dealership) and see if I could get some help. They told me that there was a fix for the noise that I was experiencing and that they needed me to leave my car for a day or two. I did that and found out that they had replaced the windows in the front doors. I could not tell that it made any improvement. And along about then I looked on the Internet to see what I could find out about why the front door windows needed to be replaced. I found that many people were experiencing a wind noise problem with their LS460s. At that point I felt that Lexus had knowingly sold me a defective car or one that had a high probability of being defective. I became very resentful about this and I decided to seek some sort of resolution. I called (my dealership) and spoke to their customer relations person and he advised me to call Lexus customer relations and he gave me an 800 number. I called and was told that I would receive a call back within three days. The call didn't come so another six weeks passed and when I went to (my dealership) for my first oil change I spoke to their customer relations rep about my concerns. He said that he would call Lexus to get them to call me and I received a call that day. The person I spoke to set me up with an appointment to have the Lexus factory rep look at my car on Apr 10. I left a two-page memo in the car for the rep detailing my concerns. The results of that was a message delivered by (my dealership) that said that my car was up to specifications and there was nothing else that could be done. After thinking about that for a few days I decided that legal action was not desirable because you would prevail through delay and besides I have never sued anybody and I really don't like that sort of stuff anyway. I decided that I would just take my lawyer money and use it to buy a new car and move on. I figured that Lexus and (my dealership) would feel a little guilty about all this and make me a fantastic deal. Wrong. I test-drove a 2008 LS460 and it had the wind noise problem to some extent too. So, I went home in a real quandary. I had looked on the Internet at some of the things others were saying about their wind noise problem so I decided to look at mine a little more carefully. Everything including my own observations pointed to a problem with the front doors. I looked very carefully and I have to say that it looked like a "battleship quality" design. There just didn't seem to be any possibility of anything that I could see could cause the problems that I was experiencing. I then decided to remove the little plastic triangle shaped trim at the front corner of the front door windows. That is a bold step to do something like that to an $80,000 car that is 6 months old. When I looked at that I instantly knew there was a problem there. There were several obvious paths for air infiltration and because it is located near the base of the side mirror there are probably some concentrated air currents too. I had a tube of silicone seal so I used that to seal up the areas that I thought were problems, a process that took about 10 minutes to do both sides and used about a quarter of a $4 tube of sealant. I let it dry for 24 hours and test-drove it and the results were stunning, no wind noise and a big improvement in the isolation from outside noise. This is the car you told me was up to spec and there was nothing else that could be done for it. I wanted to share the good news with you with the expectation that you would use my information to get yourself and your customers out of a terrible mess. I shared my information with (my dealership) and that night I had a call from one of your customer relations people that I thought that was going to be a thank you for sharing my find. That person was calling to tell me again how sorry you were that I was still unhappy but the car was performing as it was expected to do. I explained to her that I had fixed my car and that I was now very pleased with it. And she wanted to know if the dealer was aware of that. I assured her that I had sent an email to the dealership telling them all was well. I waited a couple of days expecting a call from Lexus thanking me for the information. When I didn’t hear anything I decided to call to see if Lexus was aware of what I had found. I told the person that took my call what I wanted and they said someone would call me back but a callback didn’t come. I then got the email address for the person who I had spoken to several months ago, (name withheld) I think, and sent her an email with details of what I had discovered. I then got an email from your (name withheld) admonishing me for using Lexus’ internal email server. I called again and insisted that I speak to a management person. After a long hold, I spoke to a very nice person – I think this person was (name withheld) - and she told me she understood that I was trying to get some information to Lexus and that I should enter it through your Lexus.com site via the “contact us” link and she would try to see that it got to somebody who could appreciate it. I made a couple of tries at that but since your site is really not structured to accept an input like mine – there is no category for giving you information – I was never sure that you got my details. About then I got an email from (name withheld) asking that I submit my proposal in writing. I was very pleased and immediately got my information into hard copy and mailed it, in a larger brown envelope, via First Class USPS mail on April 25th. On April 30th I called Lexus to confirm that you had received my information. After a long hold I spoke to (name withheld) and explained that I wanted to confirm that you got my package of information. She said that she would have someone call me. On May 2nd I did finally get a call from one of your snooty attorneys - she made me so mad I didn’t get her name and I hung up on her – telling me that Toyota was not interested in my ideas and inventions. Are these people I mentioned Toyota/Lexus employees? I guess it is possible that we are both victims here – maybe I have been caught in some sort of Internet phishing deal. Sometimes it feels like I am dealing with the Keystone Cops instead of a luxury automobile manufacturer. I am not selling anything or seeking a reward or compensation. I am not seeking publicity - I am a very private person. I don’t want to embarrass you and I have tried not to do that. I am aware that many other LS460 owners are having a wind noise problems too – it is all over the Internet. You had to know that my car had a possibility of having this problem when you sold it to me. You evaluated my car just a few weeks ago and told me that nothing else could be done. There even seems to be some evidence that there is a campaign to convince people that this problem is imaginary. I assure you there was a problem with my car. The problem was so annoying I was going to have to get rid of the car so I could get some relief. I fixed it in about 10 minutes for about $1 in materials. I believe that something like what I did to fix my car could fix the wind noise problems that some of your other customers are experiencing and I believe that the 08 LS460 that I test drove could benefit from that kind of fix too. If it is a remedy for some of them it would also help you. I want to share that information with you and I have tried to send it to you several times. I am unable to divine from anything so far, if you have received my information. Or if you have received it and don’t “get it.” Or if you have looked at it and see that it is Overtaken By Events because you were already aware of the things that I found and are in the process of getting a fix out to help everyone who suffers. The only indication I am getting from you is that you are not interested in my ideas. I have not tried to sell any ideas or inventions to you – I am trying to share information. A good thing for you to have done would have been for you to look at my correspondence carefully, thank me for pointing that out to you and sent me a coupon for a free oil change to help compensate me for the postage and the multiple trips to the dealership trying to get this problem resolved. I would have been happy. My car is now exceptionally quiet. I didn’t know it was possible to make a car as quiet as mine. It doesn’t even have a whisper of air noise around either door. I have no reason to continue to pursue this – I should just be pleased with my car and let it go. I am still mystified as to why you are working so diligently to keep me from telling you about this. It is conspicuous that many of your customers are unhappy and that your reputation is suffering. There are other ways for me to get my information out. So, if you are not interested I will just move on to share it some other way. We are a connected society today and the Internet is a very powerful tool for sharing. I will continue to try to keep you informed if I find anything new in this regard. Anything that I send you is FYI of course. Please don’t have one of your attorneys call me again with a warning about “ideas and inventions.” I would like to let this cool off and I hope you understand the wisdom of doing that too. After all of this I made one last effort to get the word to Lexus by going to the other dealership in my area and presenting them an envelop containing the details of how I fixed my car including several 8X10 color photographs. The response to a follow-up call to them was that they could not do anything that was not approved by Lexus. On 08Feb10 I sent the following letter to James Lentz, Toyota’s main man in the USA, just to make sure that they understood that the wind noise problem was a simple problem that could be easily repaired. I know things are stressful at your place because of recalls and rumors, so I hope you will receive this information in the spirit that is intended – non-threatening and helpful. In October of 2007 I purchased a new 2007 Lexus LS460, VIN JTHBL46F075051819 from Sewell Lexus in Dallas. I returned the car multiple times to the dealer with complaints about wind noise around the front doors. Eventually, after the glass in the front doors was replaced, I was dismissed by the dealer after a “Lexus Technical Representative” ruled that my car “met all specifications” and I was told that nothing else could be done about the wind noise. The problem was so severe I was not going to be able to keep the car. I quickly found a way to fix my car and I tried, unsuccessfully, to share my information with Lexus at multiple levels. I will not bore you with the details but if you have some interest, here is a link to a description of how I tried to inform your company. Since I was not able to get through to anyone at Lexus I decided to try to share my information with the user forums on the Internet, with the expectation that Lexus would quickly pick up on this and get it solved. Well, it is now almost two years later and by all indications Lexus still doesn’t understand what is causing the wind noise problems in the LS460s and LS600s. The discussion goes on for more than 45 pages (668 entries) and contains numerous reports from LS owners from all over the US and Middle East describing how they have repaired their cars with a DIY fix that I suggested. They are using a repair that is commonly referred to as the “jmcrany fix” (jmcraney is my user ID in the discussion) and I have been transformed into a folk-hero. If you will read all the discussion, and it is very long, you will see several comments from owners saying that doing this fix has saved Lexus from having to buyback their cars. I get inquiries, two or three a week, from prospective buyers asking if you have successfully addressed the wind noise issue. I have looked at one of your 2010 models and I can see that nothing has changed in the area of the trim and now, last week, I had a report from someone in KS telling me that he had just test driven a new 2010 LS460 and that it had wind noise around the front passenger door, and he had decided not to buy the car because of that. Your company, dealers, salesmen and customers are suffering unnecessarily. The LS460s and LS600s are exceptionally quiet and those that aren’t will be when the trim defect is adequately repaired. Your clever engineers can develop a repair that can be effected in the dealership driveway or customer driveway in minutes. All of the cars, even those without any perceptible wind noise, will benefit from the repair – some of the cars come with the wind noise problem and others will develop it while they are in service. Continuing to ignore this problem increases the risk that your business enemies will use this against you. My best wishes that Toyota will emerge from the current turmoil to continue to produce the superb and innovative automotive products that they are so noted for. I did not hear anything from Mr. Lentz. 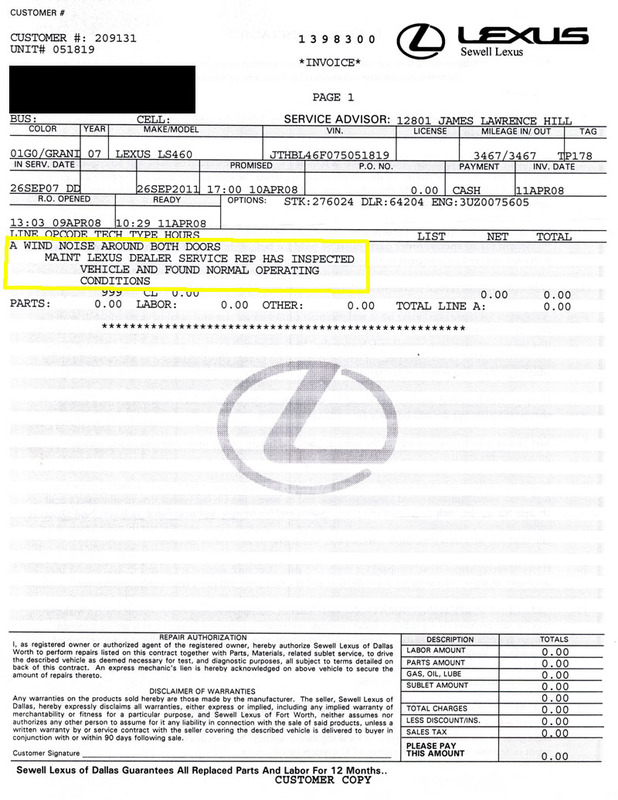 At the same time that I sent Mr. Lentz his letter I also sent a copy of the letter to Lexus Customer Satisfaction in an email with some JPG photos of the repair attached. I received the follow letter, via USPS mail, for Lexus on 25Mar10. Last edited by jmcraney; 07-21-10 at 10:25 AM. Outstanding write up, pics etc sir!!! Thx jmcraney for all of the time you have dedicatied to this problem, you are an asset to CL and the LS460/460 L & 600h forum! Do you know of anyone who has had the 'window track deformation' TSIB performed, and if so, do you know what it entails? The reason I ask is I am wondering if it's worth having Lexus do that fix prior to doing your patch. I think these are warranty issues. 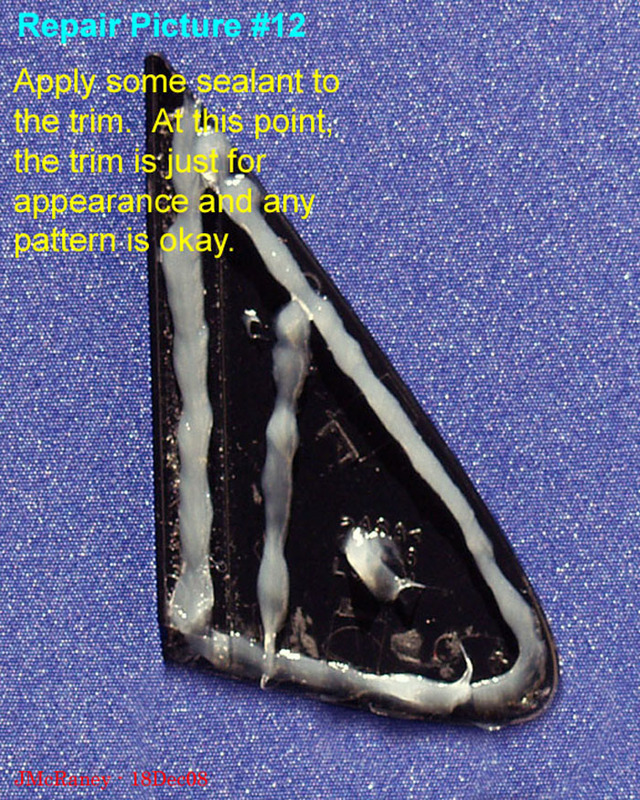 The triangle trim repair is so easy for anyone simi-skilled or better that you should not give too much consideration to the timing. I sense that you are more than semi-skilled and you can probably redo the repair in ten minutes if necessary. Last edited by jmcraney; 06-09-10 at 06:27 AM. The moderators should post this on the repair page without any more posts.. Excellent thread ... it just seems so redundant that this has to be done by us. We pay 70k plus for these vehicles. after the dealer (Sewell Fort worth) attempted to fix my windnoise concern, My car still has windnoise. I guess I have to do it myself. I was on vacation and was able to do the repair via Jeff's instructions and the noise is gone! Thx for your help Jeff (via e-mail) and the metal cut outs, you are the man just in case no one has said it. To members here who have this issue and it bothers you, do not wait any longer to repair it yourself. You will be very happy you did, 20 mins and you are done or should I say CAKE! I just did my wind noise tsib two weeks ago. The driver side noise is gone, but passenger side is still about the same before the new glass and trim. Long story short, just came back from the dealer and guess what, they replaced the triangle piece from the passenger side, now my wind noise is almost completely gone. So I guess may be Lexus did listen!! Jeff, I have not been visiting the Forum much the past 6 months to a year since I have been busy with other important things in my life. However, I once again want everyone to here to know that you are beyond generous with your time and effort and your ingenuity and expertise is unmatched. As I stated on several occasions in the past, this world would be a much better place if there were a few more people like yourself around. Thank you again my friend. I once again want everyone to here to know that you are beyond generous with your time and effort and your ingenuity and expertise is unmatched. As I stated on several occasions in the past, this world would be a much better place if there were a few more people like yourself around. Thank you again my friend. Jeff - I wholeheartedly 'second' PatsSoxFan's kudos to you for your OUTSTANDING write up and corresponding documentation of the wind noise fix which hopefully will help many. I've already filed it for future reference should the need arise as we still have two LS430's w/ no problems but will probably own a 460 before long. My heart goes out to you as you obviously have been facing impenatrable obstacles at every turn in trying to get your fix in the proper hands at Lexus to no avail. Fwiw, when I was in the corporate world and on occasion received consumer suggestions, ideas and fixes, we were instructed to immediately forward them to our legal dept. w/o a response, no matter how good said idea or suggestion may be. It's simply part and parcel of today's litigious society that this be necessary so bottom line, suggest you don't take it personally no matter how much the frustration. I am going to attempt the fix very soon thanks to Jeff and his hard work he has put forth on this effort! Simply put, Jeff is the man!! I certainly appreciate ya! Jeff and I emailed back and forth a month or so ago, and not only did he take considerable time to help me out, he hooked me up when I was having difficulty locating some of the supplies to do the fix. I'm pleased to say the fix worked great, and let me reiterate the thanks and kudos from some of the other members on this board. Jeff's a great guy and his service and contribution to the Lexus community is absolutely incredible. Thanks again, Jeff! Keep up the GREAT work! thank you for your excellent DIY on this noise issue fix. Regarding the template you posted, is it "life size"? I can just print it out and trace it? It looks a little small comparing to other pictures. I have not cracked mine open to be sure though. Also, the top of that template is "rounded" out instead of pointed like the metal ones you installed in other pictures. Can you clarify? Thanks. 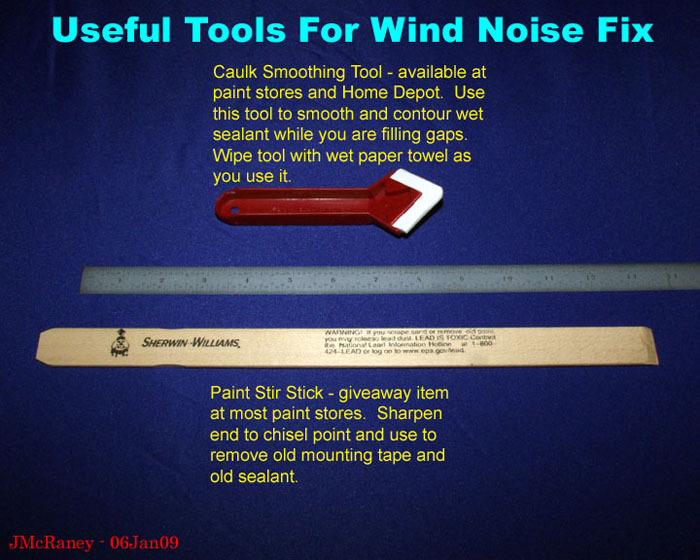 Quick Reply: Instructions For The "JMcRaney Wind Noise Fix"